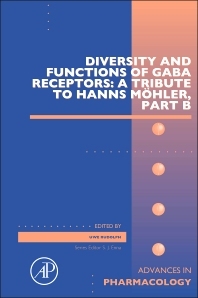 Diversity and Functions of GABA Receptors: A Tribute to Hanns Möhler, Part B, a new volume of Advances in Pharmacology, presents the diversity and functions of GABA Receptors. The volume looks at research performed in the past 20 years, which has revealed specific physiological and pharmacological functions of individual GABAA receptor subtypes, providing novel opportunities for drug development. Dr. Rudolph is Director of the Laboratory of Genetic Neuropharmacoloy at McLean Hospital and Professor of Psychiatry at Harvard Medical School. He studied medicine and completed a research thesis on G proteins at the Freie Universitat Berlin, Germany. After postdoctoral training at Baylor College of Medicine in Houston, Texas, where he developed a mouse model of inflammatory bowel disease and colon cancer, he moved to the Institute of Pharmacology and Toxicology of the University of Zurich to work on GABAA receptors. There, he developed different lines of knock-in mice in which diazepam-sensitive GABAA receptor subtypes were rendered insensitive to diazepam by a histidine to arginine point mutation. Studying these mice enables researchers to uncover unique functional roles of GABAA receptor subtypes. In 2005, he joined McLean Hospital in Belmont, MA, and Harvard Medical School, where his research group is elucidating the functions of GABAA receptor subtypes in defined neuronal populations.